Add a 'digital pin' to the map to tell New Zealand about a useful, inspiring or ground-breaking digital inclusion initiative, group or resource. 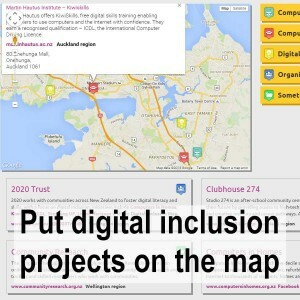 The information will appear on this Digital Inclusion map, and also be exported to the Digital Divide map at www.digitaldivide.nz developed by InternetNZ in partnership with the 20/20 Trust. It doesn't have to be your project - just one you think deserves to be more widely known. You don't have to fill in every box - just tell us what already public information you know and we'll do the rest. Please first check it's not on the map already and read the FAQ. Give the usual name of the organisation, project, resource etc. Where can I find more about it? Please give the resource's website address, blog, Facebook or other link with more information. If you have no web address, please give the resource contact email or phone. What type of resource is it? Choose the best fitting category. How would you categorise this resource? Suggest a new category name, or say what keywords you would use to search for this resource. Who should we contact when this listing needs updating? This is in case we need to clarify some details with you. Optional. Thank you! We’ll make your digital inclusion resource (Digital Pin) live here on the Digital Inclusion map as soon as we’ve checked it. We’ll also include it in our next data extract for upload to the Digital Divide map (www.digitaldivide.nz), developed by InternetNZ in partenership with the 20/20 Trust.